In the U.S. , the ATC system (for example at Wichita, KS) smoothly accommodates numerous airliners, business jets, helicopters, and training planes simultaneously. Each seat in the airplane was equipped with headsets and everyone would be able to hear what we said to the controllers, and the controllers said to us. It was an extraordinary group of passengers. There was the Chairman of the Civil Aviation Safety Authority (the Australian equivalent of the policy and rule-making part of the FAA), the Chairman of Airservices Australia (their air traffic control organization), and the heads of various departments of the ATC organization. 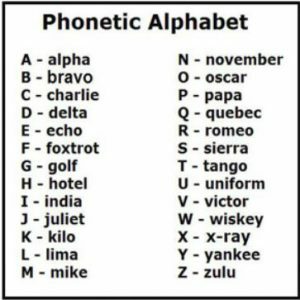 “Roger One Zero Foxtrot, turn right heading two-five-zero. Intercept the localizer and track it inbound. Descend and maintain four-thousand.” The controller was completely calm and unperturbed. As measured by our GPS, in eleven minutes from lift-off at Borrego Springs we had flown the 55-mile trip and were on the ground at San Diego’s Montgomery Field. The Australians were awestruck. The amazing part was not the speed of the airplane. It was the unbelievable willingness and ability of the controller to accommodate us without hesitation and completely without advance notice. That simply is not done in Australia (and for that matter, in the rest of the world). It was what the contingent was here to see, and they certainly got what they came for. Martha and I have flown throughout Australia in general aviation airplanes and have seen many examples of this contrast. It is not uncommon for the presence of a single airliner to cause a general aviation airplane to be held outside a control tower’s airspace (today called Class D airspace), or for a hovering helicopter to be required to land. By contrast, in the U.S. the ATC system (for example at Wichita, KS) smoothly accommodates numerous airliners, business jets, helicopters, and training planes simultaneously. 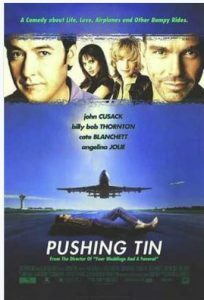 Pushing Tin is a 1999 comedy-drama film directed by Mike Newell. The film is loosely based around the real world New York TRACON radar facility. In spite of operating the world’s largest and busiest air traffic control organization, the FAA’s ATC system is legendary for its willingness and ability to flexibly accommodate traffic of all varieties and speeds. As dramatized by the movie “Pushing Tin,” it is built into the DNA. Controllers take pride in their in their ability to move airplanes efficiently. It is all about providing access. Martha and I see this flexibility all the time. We often depart San Diego from Montgomery Field, which has a mix of traffic ranging from Cubs to jets. Yet the ATC system there efficiently takes care of all comers. Frequently we get our departure release before we get to the runway, and never have to set the brakes of our old Falcon 10 before takeoff. Then at Wichita, KS, our frequent fuel stop on our trips to the East Coast, the same thing happens again. The airlines often complain about delays, but our experience indicates when there are delays, they are most often caused by too many aircraft being scheduled to take off or land on the same pavement at the same time, rather than by the capacity of the ATC system. General aviation aircraft don’t add to the delays because we mostly use different airports and runways. Sometimes ATC is effortlessly the star of the show when even the fixed base operators at their airport can’t keep up. We were at an event the other day that ended with dozens of jets all wanting to leave at about the same time. Aircraft had to wait as much as two hours for the FBO to move the aircraft to where they could be fueled and start engines. But there was absolutely no delay from ATC. We taxied out to the runway and were cleared for takeoff as soon as we were ready. And to help make things run smoothly with general aviation pilots, the U.S. ATC system partners with them. When services are provided on a workload permitting basis, such as flight following for VFR aircraft, controllers will still go out of their way to provide service, even when they appear busy. Plus, ATC proactively engages with the community. A recent flying club meeting in San Diego had representatives from multiple local control towers, SOCAL TRACON, and Los Angeles Center. All had shown up to explain to pilots how they could get even better service. An extended period of confusion resulted because the controller couldn’t find the misspelled waypoint. When the controller realized what had happened, he simply corrected the waypoint name, and didn’t say a word to the pilot about using an incorrect phonetic code word. We have something great going for us with ATC in the United States. They are general aviation’s best friend—indeed, they are often GA pilots themselves—but we have tended to take them for granted. 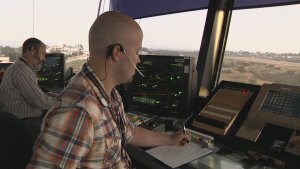 You might say they are our “unsung heroes.” Among other things, ATC services are the key to the unique connection that lets general aviation tie rural communities to the rest of our economy. Architects, lawyers, developers, ranchers, and small businesspeople of all kinds use airplanes to make operating in smaller communities economically viable. General aviation helps them connect their businesses to larger communities, and make their goods and services broadly available. To protect this special relationship that U.S. general aviation enjoys with ATC, we need to preserve the oversight that Congress provides in ensuring that a profit motive doesn’t change the special service culture of ATC. ATC absolutely ain’t broke. Let’s not let people, who don’t have a clue how well it works, try to fix it. This entry was posted in Blog & Stories, Flying Magazine Articles, John King on September 13, 2018 by Pilot One. You have no idea just how much this article resonates with me. I so miss the US ATC system. The controllers in the UK as just as good and professional as the ones in the US, the main difference is the FAA and the CAA. They are not know in the UK as the Campaign Against Aviation for nothing. The CAA are still living in the time of Wilbur and Orville. What makes it worse is that the rest of Europe seem to be little better and because of the multiple counties involved in any flight over here, clearance can take ages to get. Don’t let anyone complain about the Feds or the system until you have flow elsewhere in the world and then they will realise just how incredibly lucky they are to live and fly in the US airspace system. Wow, thank you for the insight, student pilot here, Have yet had to talk with Atc yet, but I’m not worried about it anymore. Thank you for sharing. I totally agree that the US ATC System is without peer anywhere in the world. My fifty years experience of being consistently served with safety, efficiency, courtesy and professionalism has proved time and again that the US Controllers are the best, without exception. They deserve our respect, gratitude and support. You are so right. I’ve been flying in and out of Montgomery since the late 60’s and the controllers there are terrific. They have always been friendly and helpful. Even before I realized I needed help. John and Martha, you’re the best. Keep it up. Thank you for the great article and see you all soon. There are three major governmental functions that must not ever be tossed into the “for profit” fray : our Military ; our Judicial System and our Air Traffic Control. When you have the best in the world why would you want to change. Lest we ever forget how FSS struggled . Potomac Approach are fantastic! As a flight instructor, I really appreciate them. There are some thins our government does very well and our ATC system is one of them! Great read, we are very fortunate to be flying in the US, the ATC system we have is without doubt the greastest in the world. Are you sure you had an IFR clearance? What was missing was the cleared so I would take it as a VFR practice approach, Your thoughts?